The Punjab Govt Chief Minister Punjab Shahbaz Sharif has launched the Youth Internship programs for the 1.44 billion Rupees. 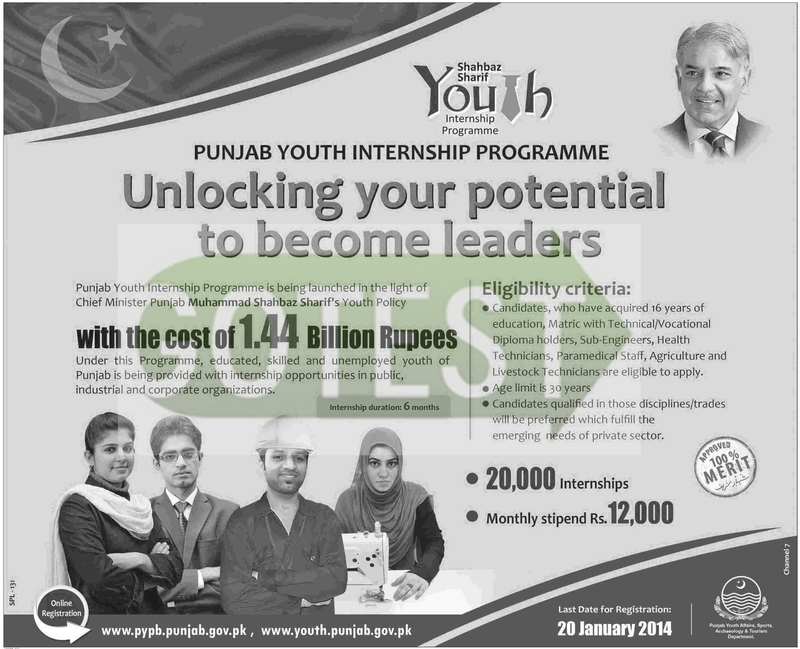 Punjab Youth Internship program unlocking your potential to become leaders, Under this program Educated, skilled and unemployed youth of Punjab is being provided with internship opportunity in the public industrial and corporate organizations. Punjab Youth Internship Program (PYIP) is an initiative of the Government of Punjab to equip the unemployed youth with productive skills to obtain better employment opportunities. The program is specially designed for the unemployed youth so that they obtain basic training to enhance their skills, which shall facilitate in a secure livelihood in the long term. It will assist the interns to get hands on experience and enable them to apply their theoretical knowledge acquired in their educational institutes. PYIP will benefit 20,000 fresh graduates who shall also receive a monthly stipend for the duration of this internship. Must have passed out in the year 2011 or onwards. The salient feature of this internship program is that the applicants can choose a relevant internship position based on their academic qualifications and interest area, from amongst the available options/ demands made by the private/ public sector organizations/ institutes. The duration of the internship will be 6 months. The interns will receive a monthly stipend of PKR 12,000/- during the internship through Easy Pay Card. If you have any queries please feel free to contact at the helpline 0800 12145 or [email protected] otherwise you can ask any details about it 24 hours and can share your issues in the comment section.